SUNNYVALE, Calif. – March 14, 2016 – SiTime Corporation, a MEMS and analog semiconductor company and a wholly owned subsidiary of MegaChips Corporation (Tokyo Stock Exchange: 6875), today introduced the SiT156x/ 7x families of 32 kHz Super-TCXOs. These unique timing solutions are available in a tiny, 1.2 mm2 footprint, which is up to 85% smaller than quartz products. Additionally, by using SiTime’s revolutionary TempFlat MEMS™ technology, these Super-TCXOs deliver ±5 ppm accuracy, which enables chronometer-grade timekeeping and the longest battery life. The SiT1568 also offers an innovative, in-system, auto-calibration feature that allows customers to eliminate timing inaccuracies introduced during system assembly, reflow, underfill, and overmolding. Designers of wearable, IoT and mobile applications such as miniaturized modules, smart watches, activity trackers, tablets, mobile phones and smart meters can use these unique features to offer the best timekeeping and longest battery life. 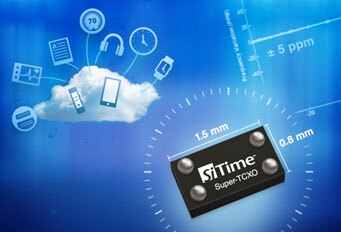 The SiT1566, SiT1568, and SiT1576 Super-TCXOs are available today in a 1.5 x 0.8 x 0.6 mm (l x w x h) chip scale package (CSP). These devices perform the following critical functions in a wearable, IoT or mobile system. Compared to a 32 kHz quartz TCXO, oscillator, or resonator, the SiT156x/7x MEMS Super-TCXOs offer the following unique features. Samples of the SiT156x and SiT157x families are now available from SiTime for qualified customers. General availability and production volumes will be available in Q2 2016. Pricing is available upon request. SiTime Corporation, a MEMS analog semiconductor company and a wholly owned subsidiary of MegaChips Corporation (Tokyo Stock Exchange: 6875), offers MEMS-based silicon timing solutions that replace legacy quartz products. SiTime’s configurable solutions enable customers to differentiate their products with higher performance, smallest size, lowest power and best reliability. The rich feature set and flexibility of SiTime’s solutions allow customers to consolidate their supply-chain, reducing cost of ownership and time to market. By using standard semiconductor processes and high volume packaging, SiTime offers the best availability and shortest lead times in the industry. With 90% market share and over 400 million devices shipped, SiTime is driving the electronics industry to use 100% silicon-based timing. www.sitime.com.